Ida Vlinorman is an Imperial acrobat living in the Elven Gardens District of the Imperial City. She is a basic trainer in Acrobatics, and is rumored to "jump off high things", including chapels, for her own amusement. Despite her reputation as a 'chapel climber' Ida never goes near a chapel, and lives a rather quiet existence in the big city. After waking up at 6am, she spends the entire morning wandering on the ground floor of her house. At 1pm she ventures outside and enters the King and Queen Tavern for a two-hour lunch. She then exits the Elven Gardens and strolls around in the neighboring Talos Plaza District for four hours. At 7pm she returns to her own district and finds herself a fixed spot in the middle of the central junction and hangs out there until 11pm when she returns home for an hour of wandering until her bedtime at midnight. She will offer services at all times except when sleeping. On the 3rd of each month, Ida Vlinorman leaves her house at midnight for her monthly trip to Chorrol. She crosses the Talos Bridge and heads northwest on the Black Road, passing through both Fort Ash and Weynon Priory. After eight hours of walking, she usually enters Chorrol through the southern gate at 8am. Once there, she enters The Grey Mare where she hangs out in the taproom. At midnight on the 5th, she heads back to her life in the Imperial City. Due to a bug, Ida will return to the Imperial City at 9am on both days; see the bugs section for details. She will, however, offer training 24 hours a day during her trip. Ida wears a set of middle class clothing, consisting of a burgundy linen shirt, burgundy linens, and a pair of russet felt shoes. She also carries her house key and a small amount of gold. She will introduce herself with "Well, well. You interested in Acrobatics training? You'd be quite a challenge. I'm Ida Vlinorman." If you talk to her about the Imperial City she will say, "It's just a sport. Chapel climbing. The Watch doesn't like it, but you don't climb chapels while the Watch is standing around." The citizens of the Imperial City will often gossip about Ida's supposed chapel climbing and her Acrobatics skills. When asked for rumors, they may say: "I understand Ida Vlinorman enjoys jumping off high things. Like buildings." and "There's something strange about Ida Vlinorman. I heard she was climbing up the chapel, just so she could jump off." During private conversations, others may say: "Isn't Ida Vlinorman an agile one?" or "Isn't it uncanny how Ida Vlinorman moves?" However, their responses show mixed feelings: "She likes jumping off things. That's because she's an idiot. ", "Maybe she could teach me how to fall off things. That's a useful skill! Much better than, say, swinging a sword or casting a fireball. ", "She's nuts. Her hobby is falling from high places." and "If you want to learn to fall off a building, she's the one to talk to." Other prominent trainers will also point you towards Ida for training. Dul gro-Shug will say: "You just have to know the right people. Look up Ida Vlinorman and Othrelos in the Elven Gardens. They're the right people." and Irene Metrick will concur: "To know the right things, you have to know the right people. Ida Vlinorman, Mandil, Samuel Bantien, and Othrelos are the right people." Oddly, Ida's neighbor Marinus Catiotus will mention Ida as his associate, even if they are never seen together: "Ida Vlinorman and me, we're associates. Same interests, same styles." 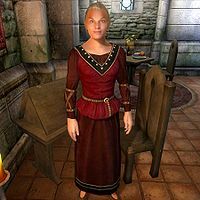 Ida Vlinorman's trip to Chorrol is interfered with at 9am on both days because of the IdaVlinormanVisitChorrolArena package; this is a leftover from when Chorrol had an Arena. Because all betting activities now take place in the Imperial City Arena, Ida will take the long trip back to her hometown. Additionally, she was supposed to spend eight hours there, but because the package conditions are set to Chorrol, she will only visit the Arena briefly, then travel all the way back to the Gray Mare. This page was last modified on 20 October 2015, at 05:30.